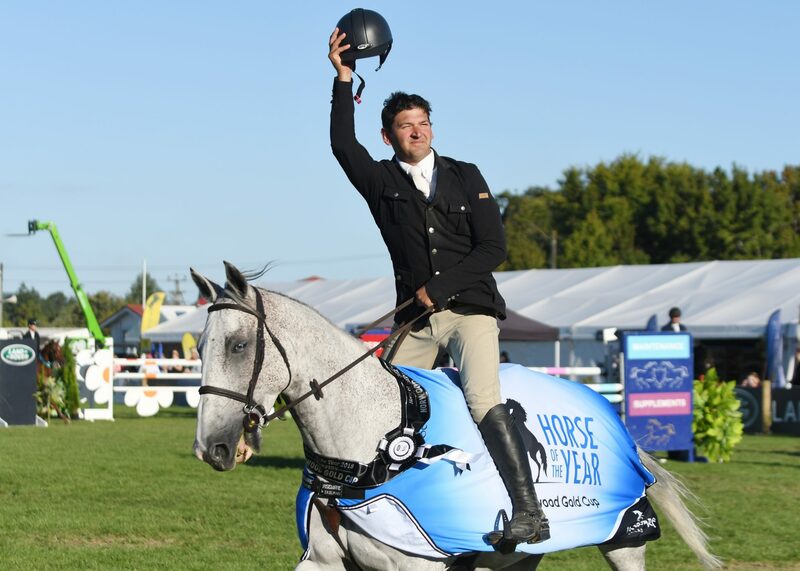 Tom Tarver-Priebe and Popeye jumped the rounds of their lives today to take top honours in the prestigious Norwood Gold Cup. Thirty-six started the class with six coming back for the jump-off – Australian visitors Clint Beresford aboard Emmaville Jitterbug and Brooke Langbecker aboard Quintago I, along with 2017 Norwood Gold Cup winner William Willis on Dollar Roll MS, Brayden Aarts on LT Holst Aunty Annette and Tarver-Priebe, who were all clear, along with four-faulter Katie Laurie on Cera Caruso. Laurie was first out, and finished on eight faults. Then came Beresford who took the second fence to come home on four faults in 50.18 seconds. Then it was Tarver-Priebe, who rode the jump-off with plenty of encouragement from the many riders and spectators around the arena. They fairly flew around to go clear in 52.32. Langbecker opted for the steady clear on the lovely chestnut stallion to come home clear in 52.32 seconds. Willis came out flying and looked to be well on track to reclaim the cup until the wall, finishing with four faults in 45.69. Aarts and his grey mare parted company towards the end of the course. “It is a huge effort to get the horse here,” said the 32-year-old from Kawerau who had planned to drive home this evening and work in the morning. He thanked his partner Lucia Voss, Popeye’s breeders Greg and Kim Best, trainer John Cottle and Jesse Linton, who had produced the horse. The win was all the more special as the horse was almost sold to Japan last year . . . but he didn’t and now Tarver-Priebe is purring. Now they are eyeing up Australia, starting in Sydney before heading to Elysian Fields. In preparation for the big trip Tarver-Priebe has been watching his diet, and he thinks it just may have paid dividends today. Popeye has been in good form of late, winning the Gold Tour Qualifier at Takapoto Estate Show earlier this month. Tarver-Priebe now needs to contemplate whether he will start Popeye in Sunday’s Olympic Cup. Results – Tom Tarver-Priebe (Kawerau) Popeye 1, Brooke Langbecker (Australia) Quintago I 2, William Willis (Karaka) Dollar Roll MS 3, Clint Beresford (Australia) Emmaville Jitterbug 4, Katie Laurie (Australia) Cera Caruso 5, Brayden Aarts (Auckland) LT Holst Aunty Annette.\ 6.